Those of you who have been paying attention have probably been wondering why I've only done two blog posts in the last six months. It's because there isn't much more I can say about the publishing industry. From 2005 until 2009, my blog was all about self-promotion, landing an agent and a publishing deal, and working with publishers to make your book a success. From 2009 until 2016, my blog was all about self-publishing, and why legacy publishing was no longer the best choice for most authors. I've blogged, at length, about changes and controversies in the publishing world, and did my part to inform (and hopefully entertain) authors of all experience levels. But, lately, nothing in the industry has piqued my interest enough to blog about it. I will continue to blog sporadically on NEWBIE'S GUIDE, if something cool happens. Or something uncool happens. I created this blog to advocate for authors, and I will continue to do that. I have also begun a new blog. I'm a huge movie fan, and have about five thousand titles in my home library. As you might guess, not all of them are good. Some, in fact, are terrible. I'm going to be blogging about the terrible ones. My son, Talon Konrath, and I have launched THE BEST WORST MOVIES EVER BLOG. Several times a week we're going to be watching bad movies and sharing our thoughts. Unlike this blog, the movie blog is meant to primarily entertain. If you're a fan of bad movies, you'll no doubt see some titles you recognize. If you don't understand the appeal of bad movies, I hope you'll check it out and learn why you need to seek out and see many of these amazing films. So far we've got nine posts live, and plan on at least a hundred more by the end of 2017. It's a rough job, but we're committed to it. Please take a look, and as always, thanks for reading! Randall just wanted to have a fun summer vacation with his family, visiting Grandma at her cabin on a lake in the Wisconsin Northwoods. Then everything went horribly wrong. Join fifteen-year-old Randall, and his younger brother Josh, as they fight for their lives on the eve of an elderly undead apocalypse. Forget everything you've ever read about zombies. But that's probably impossible, because you know you've read a lot. So maybe just put aside your preconceptions, because this living dead epic will make you remember why you fell in love with this genre in the first place. Part scary, part funny, this is a living dead Armageddon like you've never seen before. This book is over 60,000 words long. It also includes a Q&A with the authors on the creation of the novel. Joe: So, after four years of writing, GRANDMA? - Attack of the Geriatric Zombies! : The Novel is finally available. $3.99 on Amazon Kindle. $9.99 for the paper version. How does it feel? Joe: What took so damn long? Talon: Someone other than me in this blog post… Nah, I’m kidding. This was a grueling process. I lost track on how many times I rewrote this book. Being in high-school didn’t help much either. Joe: So how much of this is you, and how much of this is your kind and tolerant father working his magic to make you look good? Talon: The story, the plot, the characters and a lot of funny things are me. The wonderful, eye-pleasing writing is my father. He also wrote a lot of funny things. 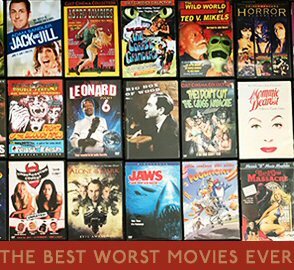 Joe: We're launching a blog called The Best Worst Movies Ever Blog, where we both make humorous comments about bad movies and try to convince more people need to watch them. A big part of the blog is Talon's 20 Second Review, where you post a YouTube video listing five reasons to see the movie. What are five reasons, in twenty seconds or less, that people should read GRANDMA? So what are you blog readers waiting for? Buy a copy!